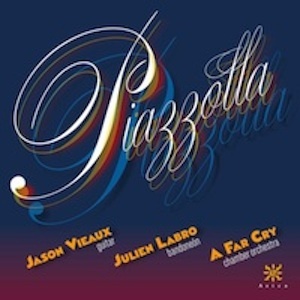 Internationally acclaimed guitarist Jason Vieaux teams up with bandoneon virtuoso Julien Labro and A Far Cry chamber orchestra in these new arrangements of Astor Piazzolla masterpieces. Jason is well known for his Azica solo releases including J.S. Bach Vol. 1 and Images of Metheny (Jason’s arrangements of the music of Pat Metheny). Julien Labro has shown his versatility with jazz guitarist Frank Vignola on 100 Years of Django and numerous recordings with Hot Club of Detroit. A Far Cry chamber orchestra, based in Boston, performs frequently in the greater Boston area as well as throughout the United States. [Short Extract] Through the centuries, music composed for dance has permeated the classical music canon. Gavottes, waltzes, minuets and mazurkas are at least as common as sonata form, and the ever-present rondo is derived from a French round dance, rondeau. It seems inevitable that music for tango, the popular Latin dance, would work its way into the classical catalog. Astor Piazzolla (1921 – 1992), straddling both the classical music and dance band worlds, led the way. Practically born with a bandoneón on his knee, he studied composition with the premiere Argentine composer, Alberto Ginastera, and with the doyenne of 20th century composition teachers, Nadia Boulanger in Paris. © 2011 Azica Records, Inc.